you are so smart to share yammy food. It's my favourite dessert, but I don't know how to make it. Now I knew. I'll try. Please share more easy recepit for us. Thanks again. Oh, thanks so much for your kind words. I'd like to share more recipes with all people who love this blog. Thanks for your support too. I like this dessert so much, I will try to make it later. Thank you so much. I was live in Australia as well but back to HK now. I just tried it tonight. It's so easy and the result is so good. Thank you!! I just tried it, and it is really easy to make. It tastes pretty good. I lived in northern UK, so there is no good chinese dessert here also. I'm glad that you made it and liked it. You're welcome. Hope you'll enjoy it. The recipe is good. However, it is very important to use the right amount of sugar. 50g sugar is sometimes convert to (both 1/4 cup) or (2 Tbsp) Do not use 1/4 cup, it is too sweet. Make sure the fire is very very low.. simmer. I found that opening the pot lid every 4 mins might be a little too often, this makes the temperture goes down and up (twice). 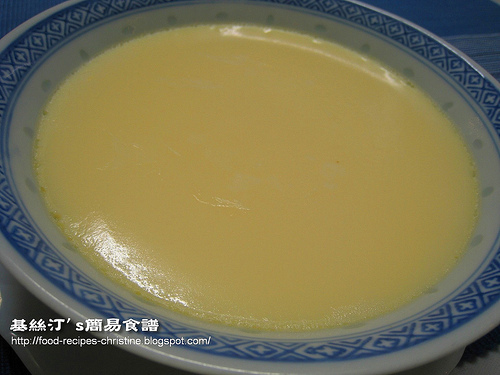 This might introduce overcook to the egg custard directly touching the inside of the bowl (as the temperture is build up from the side to the centre). 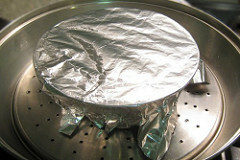 I found that cooking time reduce to 10min with only opening the lid right in the middle (after 5 mins). The result was better for me using 10mins cook time and open lid after five minutes than 12 min cook time open lid every 4 mins. And the touch of ginger extract (pure juice 1 1/2tsp). was a very nice touch. I would never make this dessert without it. Hi, thanks for your recipe. I'm actually in Brisbane now for a short course and I found your recipe because I'm going to cook for my homestay family tomorrow. Thanks. Hope your homestay family enjoy your cooking! Hi Christine, thanks for your recipe. hi ~ 今晚我剛剛跟足你的步驟做了這個,不過蒸的時間比較耐, 12分鐘還未凝固, 於是繼續蒸下望下, 最後用了差不多35min... 可能因為容器傳熱不好..
thanks for your recipe! 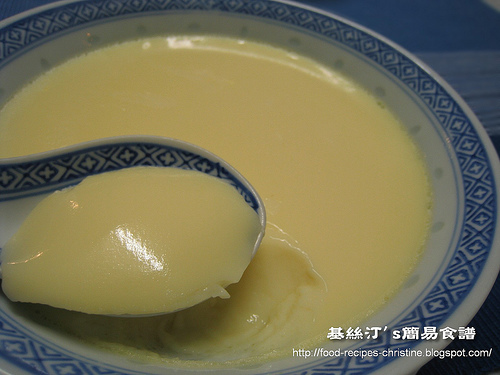 I've already made my own steamed egg with milk! It's sooooo nice and smooth! Hi Christine, I just tried this recipe. I like it very much! Thank you very much. hi christine, i was wondering if i could put it in oven instead... pls advise... thanks a lot!! Yes, you can do so if you like. Why do you want to bake it instead of steaming? very nice desert! easy to make, and tastes so nice! 真的很感謝妳的網站, 因為我真的很想念香港的甜品和食物, 所以就上網找香港甜品食譜, 之後就找到來這個wonderful website。這個鮮奶燉蛋是其中一個我很喜歡的甜品, 我照妳的食譜做, 大成功, 我老公也很喜歡呀! 謝謝!!! 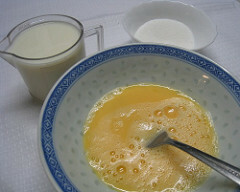 Hi Christine, I tried this recipe this morning using rice milk. Rice milk is a bit sweet by itself and I didn't add any sugar. The result is excellent, exceptionally smooth indeed! I am an ardent reader of your post and have been enjoying reading each and every of your recipes. May I add some ginger juice ? as I failed to get the right texture for 薑汁撞奶 in several attempts (with no thermometer at home). Thanks . Sure, you can add some ginger juice if you like. Hope the best for your new attempt. 你好. 多謝你的recipe! 我三日內已煮了兩次, 又好味又易煮. 但不知為何兩次都是嗰碗旁邊有很多小孔, 這是不是正常? 還是我煮得太久? 謝謝! Thank you very much ! Yum Yum ! I must try this one tonite ! Yeah! Dear Christine, thx for ur recipes..i tried this n my family love it very very much ah!!! take care. very useful ! i can make a nice one , thx thx. Love your website!! Want to know if the steps are the same if I only want egg whites? And is it ok to use skim milk 0% ? Or should I use regular 2% milk? I've already translated this recipe and posted here. its an awesome recipe TQ!!! Hi Christine !! i like正街的源記 雞蛋糕 so much !! Do you know how to make it ?? can you teach me !!! Thanks !!! if i put in two bowl to steam it , how much time i need ? It won't be too long. Only a few minutes more to heat up two bowls.